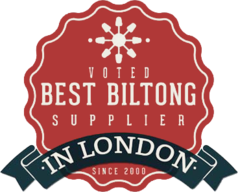 Why not see what all the fuss is about, try our delicious award winning Biltong! 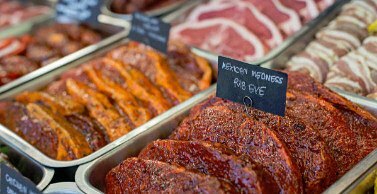 Making Biltong for over 20 years in SA and in the UK, our unique flavours and consistent quality have firmly established us as a favourite outlet to get authentic Biltong and Dry wors from. We are thankful to our many customers spread far and wide still supporting and promoting us. 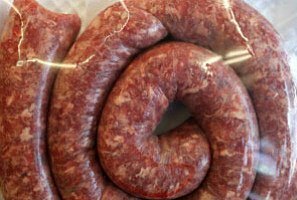 Famous for our unique flavours of Biltong, Dry Wors, and Boerewors. Try our amazing grass fed succulent steaks and delicious meats. Our friendly staff are waiting to assist you. Snoggys shops are inside Wimbledon station and on the Upper Richmond Road. Our products are also sold at Max's outside EAST PUTNEY STATION and at Picollo outside PUTNEY OVERLAND in Putney High street. Check us out on FB and review us to win a chance of getting free products in our month end draws. Thank YOU for your valued custom and support. "Amazing service and the best biltong I have ever tasted!!! Yo, thanks for the free recipe and spices on our beef roll, it was awesome!" 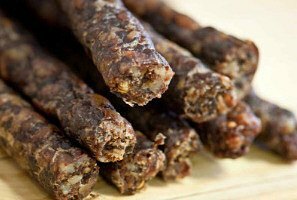 "I was introduced to Biltong through a S/A friend of mine. I have loved the stuff ever since. I actually work central London and often pop over to Wimbledon station just to get £20 worth of..."
"I don’t get a chance to visit very often, but when I do the biltong never fails to impress. The only problem is I never seem to buy enough!" "These guys know their stuff. they do a lot of South African dried meat like biltong but they have the BEST steaks in town. They season the steaks and they are as good as any restaurant steak I have..."
"Simply the best blerry boerie around – and the biltong is excellent too! All perfectly vegetarian of course! Staff friendly and loads of saffa produce. Keep up the good work guys!! –..."
"Wimbledon’s finest Saffa shop! I’ll have you know that The Jen is a frequent shopper and it’s the only place she goes to restock the cupboards at the PharSide HQ with Saffa..."
"All I can say is “Skitterand” !!! Too lovely ! What no mail order facility? Our cat, a finickety Siamese called Lola, goes mental for Snoggy’s droewors. 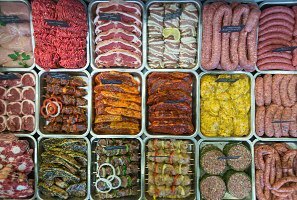 No other kind will do...."
"Great steaks, great Biltong and snags. All round great service and great people. Not a bad word to say really!!!" "There is simply no comparison when it comes to Snoggy’s products. You guys have made a hell of an impression on some of my English colleagues. They are as addicted to the biltong & droewors..."
"My 2nd visit this week and so the addiction begins"
"Much is written about impulse and addiction in society these days, and I suppose if there was something - for me - that encapsulated this, it would be Snoggy’s South African shop in Wimbledon..."
"Bought some boerie for my first braai of the 2014 spring and was overjoyed; a delicious taste of home, and at £8.99 per kg (for the plain boerie) it was totally worth it. Also got myself a..."
"What a find. It just gets better. The droewors, irresistible, the biltong, mouthwatering, the service, outstanding. I ordered about £160 of meat (ham, pork, t-bones, and fillet) for Christmas..."